"County Recurrent" Presents: Boat Watch ! 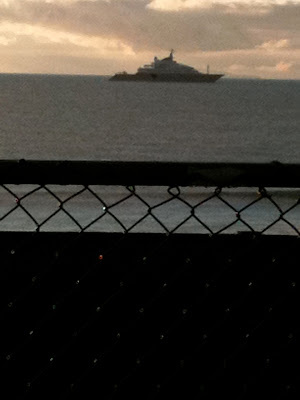 The Recurrent Grapevine and two reliable sources indicate that Malibu has yet another Super Yacht at anchor off the Malibu Pier. 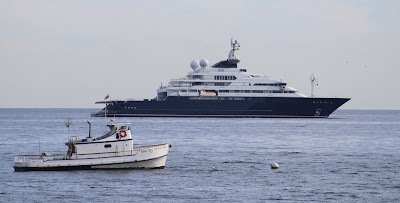 This time by Paul Allen (Microsoft) and his 414 foot yacht named "Octopus", which according to LACo Recurrent, Steve Hotchkiss, is bigger than "A", the Ruskie's yacht, which visited Malibu this past summer, at 390ft. 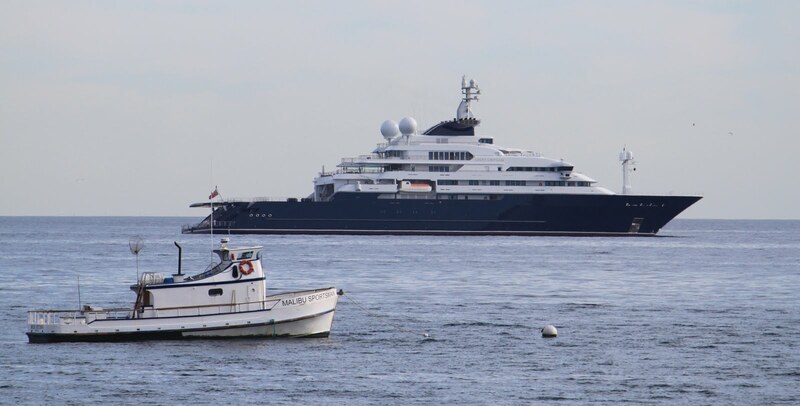 "This so-called "super yacht" -- dubbed Octopus -- is owned by Microsoft co-founder Paul Allen. It's 414' and cost new $162 million in 2003 (see photo below); it's the 11th largest in the pantheon of yachts owned by billionaire dudes around the world. It's not as dramatic as the Russian billionaire's yacht that looked like a big shoe and spent the summer parked off Surfrider, it's still ain't too shabby. The 48' Malibu Sportsman sport fishing boat is in the foreground and appears dinky (see photo below). I watched as the Octopus launched it's tender (one of seven that are onboard) off the transom and head toward the Malibu Pier. 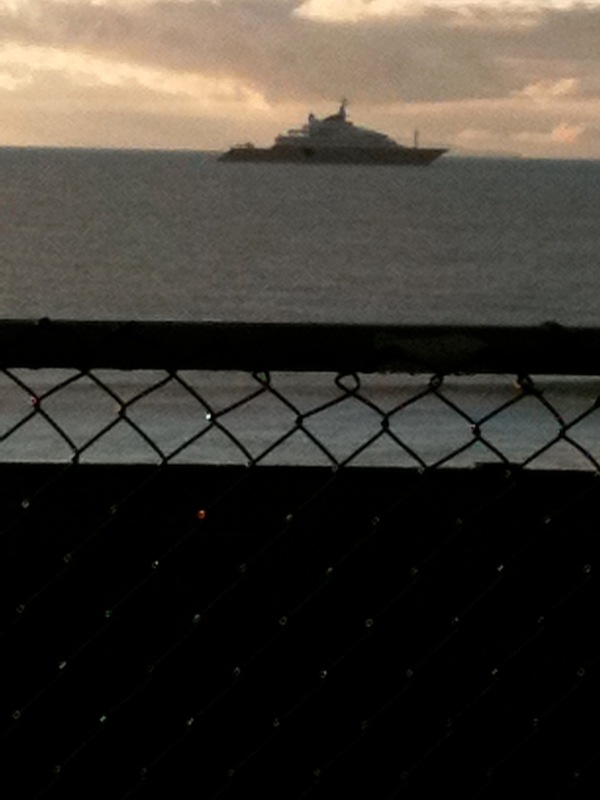 The tender boat appears to be part RHIB, and it picked up a dude off the Pier stairs and headed back to the yacht." DISCLAIMER: County Recurrent is not affiliated with nor sponsored by LACOLA or LACoFD. The Classic "Old School" Green Churchill Fins, above and below, circa 1975. Courtesy of "County Recurrent. Below, are a pair of the much heralded Voit DUCK FEET fins, which according to LACo Recurrent, Jeff Gaines, Ret., "Duck Feet are the best body surfing fins. The have great speed and acceleration. The are comfortable. Churchill style fins are easier to walk in But I don't wear them to walk. The only down side, is you can't wear them with booties, which matters in the Northwest." Below, a mismatched pair of circa late 1980's Churchill Fins unclaimed at the end of a summer season on Santa Monica South, and then reclaimed/rescued by the undersigned, shown here on Oct. 1, 2010 at Zuma during a buoy swim and bodysurf session. Of the Churchill Fins, retired L.A. City and LACo Recurrent Lifeguard, Johnny Johnson, whose father co-owned Churchill Fins with Owen Churchill, said: "The design of Churchill swim-fins was based on the shape of a dolphin's tail. The design of "Duck Feet" was based on... ducks. I rest my case." "Owen Churchill is given credit for inventing the swim fin. His fins are well-known throughout the world. The idea came to him while on a trip to Tahiti in the mid-1930’s, where he observed a group of natives on the beach weaving small mats from palm fronds and dipping them into a tub of hot tar. When the tar had cooled and hardened they would tie these mats to their feet and enter the ocean to swim or free dive. Churchill was fascinated by the tremendous increase in swimming speed this generated. 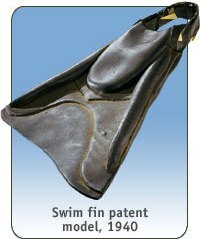 He returned to the States and immediately began developing and patenting the first rubber swim fins. I was there at the Olympic Swim Stadium in Los Angeles in 1940 when he first introduced his invention. I watched in amazement as each swimmer wearing the black, vulcanized rubber, Churchill swim fins easily shattered the world’s records for the 50 and 100 meters. Soon after, Churchill made his fins available to the public. He sold very few that first year but I rushed out to be one of the first customers at $4.95 a pair. It was a sizable expenditure but no problem; in 1940 I was making 35 cents an hour as a lifeguard at the Venice Salt Water Plunge. But let’s take a look back a few years, back to over 200 years before Churchill’s 1930’s invention. It is the year 1720, and we’re not in the South Seas, we’re in the waters of Boston Harbor. Bostonians were terrified of the water at that time. One writer summed it up this way: “The most frequent use of the harbor is for transport, and drowning”. However, there was one 14 year old boy who had no fear of the waters of Boston Harbor. He frequented the wharves, marshes and docks, loved the water, and taught himself to swim expertly. In later years he advocated universal swim lessons for all, unheard of in his day. In his own words, “I had a strong inclination for the sea; living near the water, I was much in it and about it and learnt early to swim well”. He developed powerful arms and shoulders from swimming and soon showed how inventive he could be at his favorite sport. He was about to conduct his first experiment and test his first invention; dozens would follow. His name? Benjamin Franklin. I learned of his exploits by studying his own writings in the Philadelphia Franklin Library, and from others who wrote about his amazing life. This quote is from the book, The New American, by Milton Meltzer: “He loved playing in the water, and not content with using his hands and feet to swim, he made oval paddles to be held in the palms to increase his speed. Then he added flippers to his feet to further increase his speed”. 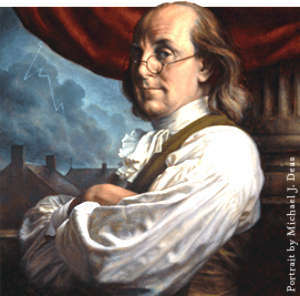 And a quote from Ben Franklin, himself, from a letter he wrote some years later to his friend, Barbeau Dubourg: “When I was a boy I made two oval palettes, each about ten inches long and six broad, with a hole for the thumb in order to retain it fast in the palm of my hand. They much resembled a painter’s palette. In swimming, I pushed the edges of these forward, and I struck the water with their flat surfaces as I drew them back. I remember I swam faster by means of these palettes, but they fatigued my wrists. I also fitted to the soles of my feet a kind of sandals; but I was not satisfied with them because I observed that the stroke is partly given by the inside of the feet and the ankles and not entirely with the soles of the feet”. So here in 1720 we have the very first hand paddles or hand fins, and the first swim fins for the feet (Leonardo da Vinci briefly gave thought to the idea of fins in the 1400’s). 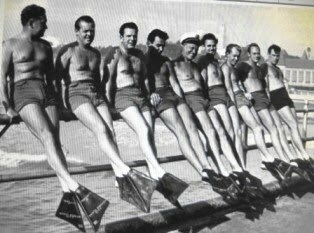 The first commercial hand paddles I ever saw were put out by the Sea Net Manufacturing Company of Los Angeles in 1944, and of course fins arrived in 1940. To fully utilize these two inventions of his for increasing his swimming speed Franklin probably experimented with some sort of front crawl stroke, (“I struck the water with their flat surfaces”), and a flutter kick with his feet to make the fins work, both of which would again put him a hundred and fifty years ahead of his time since the breast stroke was the only method used by the few people who could swim at all at that time; even the side stroke was unknown. In addition, Franklin came up with other ideas to increase his speed in the water. The marsh or pond area of the harbor where he swam was one mile across. On days when a brisk wind was blowing, he would send his friend with his clothes to the other side, a mile away. 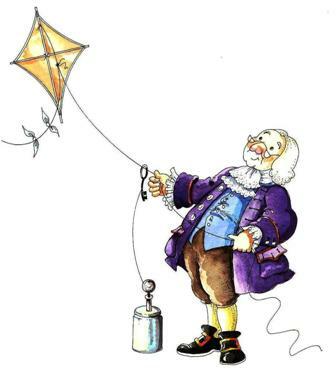 He would then let loose above the water and into the wind a sturdy kite that he had made, and hanging onto the cord, he would race across the harbor “at a most agreeable speed”. Sounds like the precursor of many later water activities that we now know, and are popular today. If there had been a handy plank around I’m sure Franklin would have aquaplaned across the harbor. Who knows what other aquatic ideas he might have come up with if he hadn’t been sidetracked harnessing electricity, inventing reading glasses, and heating stoves, and lightning rods, and the odometer, and countless other inventions, and then, of course, taking part in forming the United States of America and signing The Constitution. And what if he had lived closer to the beach when he was a kid in 1720 instead of inland on the other side of the harbor? And what if he saw those beautiful, white- crested waves rolling unridden toward the shore, and there was an old, thin plank of wood lying on the beach? Do you think it possible, with that imagination and inventiveness of his, that he just might have come up with another of his aquatic ideas?" © Cal Porter 2010, all rights reserved. 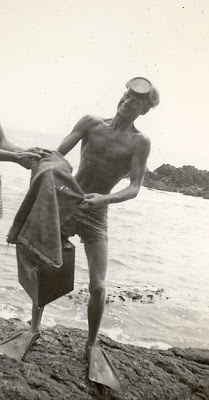 Many Thanks to Cal for once again sharing a topic near and dear to any beach lifeguard, and especially the important role played by Owen Churchill. On big surf days, we are all glad we've got our fins on to help us get out through the surf to make rescues. Even if we are bodysurfing on a workout or a day off, fins are essential. 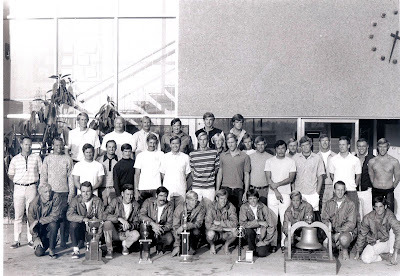 We leave you now with a few photos from the County Recurrent archives that feature various contemporary swimming fins, both in the field, as it were, and on the shelves. LACo Recurrent, Ret., Roger "Chopper" Lyon, R.I.P. "There will be two celebrations for my father. The first will be a Paddle Out. This will be at 0900 on Friday, October 29, 2010 on the north side of the pier in Cayucos. All are welcome both in the water and via the pier. A celebration of the life of Roger Chopper Lyon will be held at 2pm on Friday, October 29, 2010 at the Hearst Ranch Dairy Barn. Look for the memorial signs at the Hearst Ranch entrance just north of the Hearst Castle entrance on Highway 1 north of San Simeon. My father was an incredible person. He lived his 61 years to the fullest and was incredibly happy. The lifeguarding and swimming community were very important parts of his life and all are welcome at either of these celebrations. Please feel free to pass on this on to anyone who was touched by my fathers life. You may also post the memorial information on your blog if you would like." "County Recurrent" just received unfortunate news of the tragic death of retired LACo Recurrent Beach Lifeguard, Roger Lyon, this past weekend, in a small plane accident while on a charitable mission in Baja, Mexico. 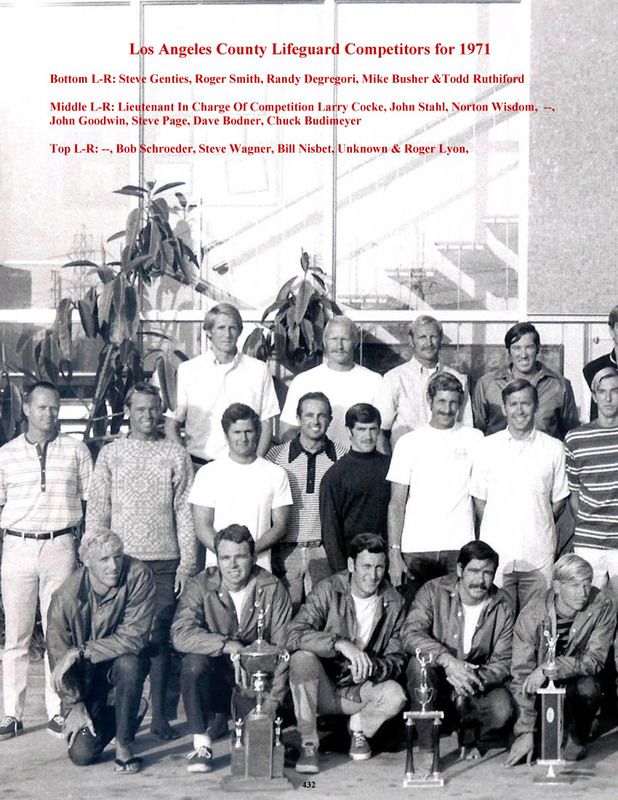 Roger, a successful attorney, in San Luis Obispo, on the Central Coast of California, was a nationally ranked age group, high school and at USC where he swam for the legendary Coach Peter Daland and was an All American in 1969, 1970 and 1971. And if you are wondering why not all four years of NCAA eligibility, just see what Kevin McVerry explains below about Roger's focus and the special program he completed. It was while at USC that Roger became an LACo Recurrent. 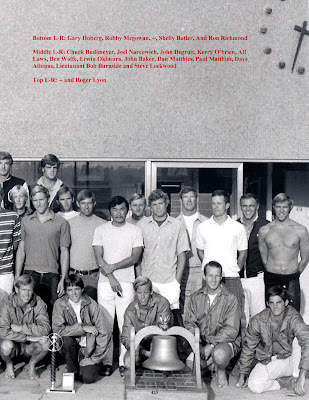 Below is a two page excerpt from Richard Mark's Lifeguard Photo Library and Book Project which features the names of the 1971 LACo Lifeguard Competitors (in the photo referenced above). Many Thanks to Richard for the courtesy of permitting us to post this. 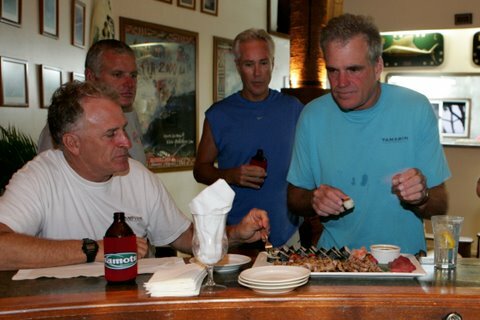 LACo Recurrent, Kevin McVerry, also informed us of the following about Roger's background: "I know that Roger went to Harvard School (now Harvard-Westlake) where he swam fly. He was right at 50 seconds. He graduated HS circa 66/67. He went to USC on their 3/3 program that gave him entrance to law school after 3 years of college. He worked up at ZUMA." 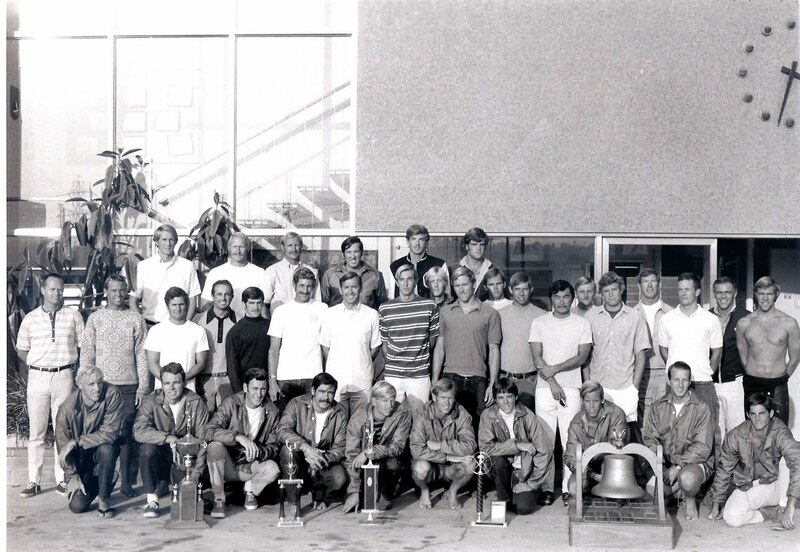 Retired Lifeguard Chief, Randy DeGregori said: "Roger was a Zuma guard in the late 60s and early 70s. One of his High School Swimming records at Harvard High was just broken about two years ago. Roger was a SC grad, as an attorney he represented the Hearst Corporation's interests in the Central Coast. Roger was active as a pilot flying volunteer doctors into Baja California. Roger was 61 years old." This Memorial Blog also includes the following remarks from some of Roger's friends and Zuma lifeguard buddies. "Chopper Lyon was a very close friend of mine for many years; here's one of my favorite stories. Jerry Heinrich and I were doubled at Tower 4. I believe this was the summer of 1970 or 71. The surf had been big for a couple of days, but was dying down this day; becoming very inconsistent. As usual, the press comes down late in the day, and late in the swell. One of the tv news channels shows up about 4 o'clock- just about the same time Chopper Lyon comes to say hello. The news people wait around for something to happen - and as usual, nothing does -----that is until Chopper takes matters in his own hands. He tells us, "watch this" ---"you're going to be famous". So Chopper, one of the best swimmers in the world, a recent competitor in the Pan Am Games, NCAA finalist for USC, jumps in the water, swims out to the drop zone, and proceeds to "drown". He looks like he just got off the bus; his arms flailing, his legs deep in the water, his head goes under a couple of times, and Jerry and I just look at each other. We go down to the water and try to get him to come in by yelling (probably obscenities) at him and waving our cans. All to no avail. Jerry and I had already been fired once by Howard Lee that year. We knew HQ was watching, they didn't know it was Chopper, and the news cameras were spinning. We dove in. When we got out to Chopper (I'm sure I beat Jerry there --- he has a different version) he "desperately" grabbed our cans. We brought him to the beach, his arms over both our shoulders, where he collapsed on the beach in "sheer exhaustion". The cameras loved it. I can't remember whether the call car came down --- but it didn't matter. We made the news that night. After the news people left, Chopper turns to us and says - "I hope Coach Daland doesn't recognize me". Chop had a tremendous passion for life and loved nature and the outdoors. He was truly a ”Lyon” of a man, I vividly remember our Yosemite backpack trips where I would walk behind him and have to take two steps to his one. I think he was at least 6 feet 4 or 5? After college we kept up with each other in the bay area, he went to Hastings, I to Santa Clara. I would drive into the city on the weekends where Chop and Susan would take me over to the Tiburon Yacht Club. My job was to walk up a cobble stone street to the Tiburon Vintners and buy the wine and cheese while Chop and Susan got the Hobbie Cat and wetsuits ready for a great fall day of sailing in the bay. After sailing, it was back to the city and a walk downstairs into what I thought was the basement of an old ghetto type building only to find a French restaurant that was right out of a Great Gatsby movie. Roger and Susan’s hospitality made life enjoyable for all of us. The weekend visits to their ranch in Cayucos (I have recently been informed they call it “Camp” now) and the fun parties outside with college friends, lifeguards and the locals will never be forgotten and were a breath of fresh air for all on our journey through life. Chop loved lifeguarding and lifeguards. 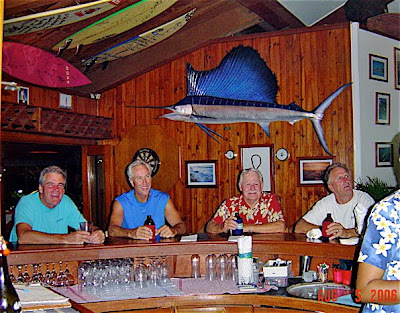 We would work the west end of Zuma in the late 60s and Chop reveled in the August south swells when the surf hit a real 10 feet. He was well respected and any guard working next to him knew he was in good hands (we didn’t have lady guards yet). Who wouldn’t with a 50.6, 100 yard Butterflier in the next tower. Roger carried his love for lifeguarding and lifeguards to the end. Recently, he told me he wished he had never dropped off the list. Any lifeguard, whether or not Chop knew them, had an open invitation to stop by the ranch. I hope my experiences give you greater insight to this incredible guy, his passing has taken a big chunk out of me. See you at the Chair two parking lot. It looks like another record year." 3. 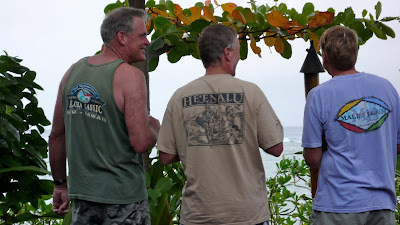 Photos Courtesy of Randy DeGregori featuring Roger on two different Fiji surf safaris, and with Randy and Billy Robinson on yet another surf trip. 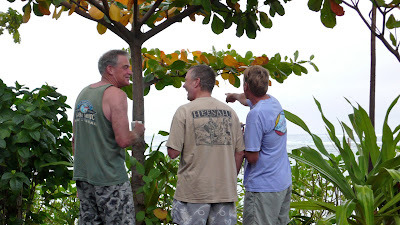 The undersigned is getting the accurate impression that these three LACo lifeguards are also life long surf hounds. note: The photos below are by and courtesy of Paul Lottman and show Roger at home, out front of his law office in San Luis Obispo, and on his ranch. "County Recurrent" wishes to express its sincere condolences to Roger's wife, Susan, and his sons, Michael and Christopher, Roger's extended family, friends and colleagues. Many thanks to our lifeguard crew and Roger's friends for keeping us all in the loop and for sharing their memories and tributes to Roger Lyon, Husband, Father, Friend, LACo Recurrent Beach Lifeguard, Surf Hound, Attorney, and so much more. After learning of Roger's years as a Zuma lifeguard in the stories above, I found myself driving north on PCH through Malibu earlier this evening at dusk. As I reached the crest of PCH at Malibu Canyon Rd. and started the descent toward Latigo, the storm clouds were thinning, the sun had just broken through a section of the clouds and was lighting up the ocean near Paradise Cove and I thought of Roger and his Zuma buddies "back in the day" and what it must have been like to work with the likes of the guards we can all see in the group photo above from the Summer of 1971 and I got the sense of how Roger must have felt driving to work at Zuma on PCH. Thinking of him now, this is where I visualize him now... driving that road at dusk after a day of surfing and heading west to check in at the Village and see friends at Zuma HQ. Close your eyes and you may see him too. He's there now in our mind's eye, laughing, loving and living life to its fullest. He is not forgotten. He is with all of us forever. OLS Bruce Saylors R E T I R E S ! Sometime in the recent past (couple of months), LACo OLS Bruce Saylors retired! "County Recurrent" News first became aware of this FACTOID this past thursday evening at SMHQ when its Editor stopped by to turn in his time card. It was during this outing that OLS Jay Hopkins happened to mention something about Bruce Saylors being retired, which was picked up by the ears of said aforementioned Editor. Surprised and Curious, we further inquired of Jay Hopkins as to specifics, which were declined by said OLS Hopkins as he seemed to infer that Bruce seemed to prefer to fade into gray quietly, as it were. Jay did voice the opinion that Bruce certainly deserves the "Bronze Savage" award. Note to LACOLA: We hereby nominate Bruce Saylors for the "Bronze Savage". Hopefully, it can be presented at an OPEN function so that all those LACOLA members who wish to attend can collectively celebrate Bruce's illustrious career. In any event, we are also interested in our readership 'commenting' below if they care to do so, so that we can properly acknowledge our friend and colleague, Bruce Saylors. And Bruce! Are you listening ! Thanks for your friendship and many years of service. We wish you much happiness and adventure in your retirement. 10-4, Bruce Saylors, is 10-7, Ret. Transactional trademark, copyright and licensing attorney. Seasonal beach lifeguard.